How did your garden grow this year? Maybe it’s still growing. Or, maybe life got in the way of those good intentions in the spring, the promising dance of dried seeds in the paper packet that got forgotten in the cupboard, and things never really germinated the way you’d hoped. With the dark damp days upon us it’s the time of year we tend to burrow down and take stock of where we’re at: what worked, what didn’t, and what might we do differently next time. 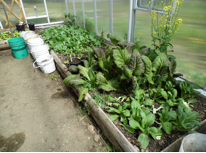 The Seed Library of Galiano (SLOG) would like to know how your edible garden grew and what seeds did well this year. 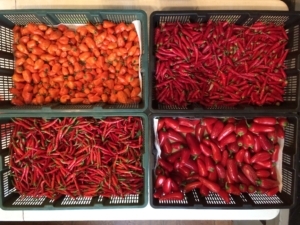 One of SLOG’s goals is to increase island food security by collecting viable seed that flourishes in Galiano’s climate. That’s why SLOG only takes seed grown on Galiano, and why, we ask our donors to fill out some paperwork (we can help with that piece). SLOG is very interested in details like germination rates and growing conditions. To help demystify the process of saving seeds SLOG and the Food Program are offering a free Seed Saving Workshop by Barry New. It will be held November 12th, from 11-1pm at the Community Greenhouse at the school garden. Barry will be sharing techniques and providing demonstrations on saving seeds for edibles such as tomatoes, peppers, grains, and other more difficult seeds. Please bring your questions, any seeds that need processing, and storage containers for your saved seeds. Paper bags and envelopes are best. Whether you are a borrower of library seed, an avid gardener who has saved favourite Galiano-grown seed varieties, or a curious community member, we invite you to drop in to one of our four upcoming “check-in sessions” scheduled through November: November 4th, 12th, 17th, and 25th. All sessions are from 1-3pm at the Galiano Community Library in the Holahan Room. We’re hoping that residents who grew seed this year and are able to donate some to SLOG’s inventory will visit us and “check-in” their seed during these intake sessions. For the month of November SLOG will have a drop-off box in the lobby of the Community Library, where, during library hours, you may drop off saved seed along with descriptive information. In closing, the SLOG Steering Committee is welcoming new members. As this is SLOG’s first autumn seed harvest we are turning our minds to receiving seeds from the community, integrating these new seeds into our existing inventory, and duplicating our seed collection for safe storage, creating a “back-up” collection. If this might be of interest to you, please consider joining our fun-loving group. All levels of knowledge are welcome. Any questions? Please contact Colleen at galianofoodprograms@gmail.com. Do you like garlic? 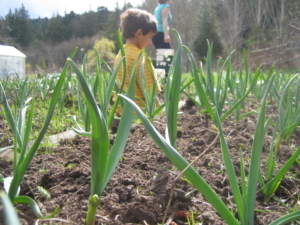 The Garlic Co-op is a group of garlic enthusiasts who collectively grow a few varieties of organic premium garlic, with scapes, in a large, shared, sunny plot at the south end of the island. Together we learn about this easy-to-grow, hardy crop, share the load of bed-preparation, seeding, weeding, mulching and harvesting, and enjoy some delicious garlic. Everyone is welcome, and no previous experience is required to join. Now that it’s fall we’re getting ready to plant our bulbs at our brand-new site! If you’re interested in checking it out, contact Emma for details. Friday, Nov. 4th, Saturday, Nov. 12th, Thursday, Nov. 17th, and Friday Nov. 25th. All days are 1-3pm. We are open for seed drop-offs for SLOG members and others who have grown edible, medicinal or native seed on Galiano. Thanks to the GCA we will also have some native seed available for loan. Any questions? Please contact Colleen. 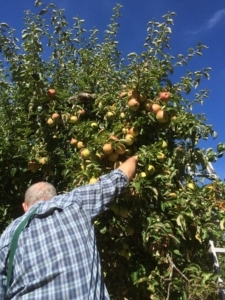 Are you a landowner with trees that are dripping with fruit, but you don’t have time to pick them? Is climbing a ladder getting to be too much? Did that one tree have a bumper crop this year? Do you have more than your family can use? Is your garden overflowing? Would you like to share the bounty with other members of the community? Would you benefit from access to healthy produce, but have no trees or garden of your own? Do you enjoy the simple pleasure of harvesting in a group? 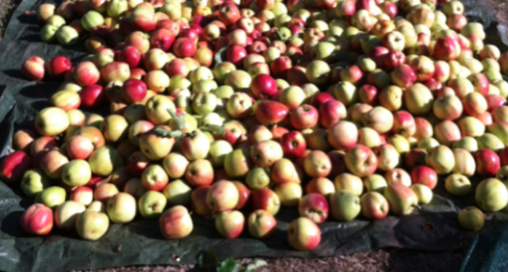 If you answered yes, then Gleaning Project may be for you. 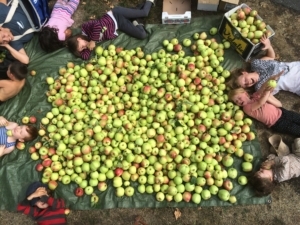 The Food Program organizes volunteers to gather to pick surplus crops that are shared between the pickers, the landowners, families in need and the Food Program’s kitchen events. 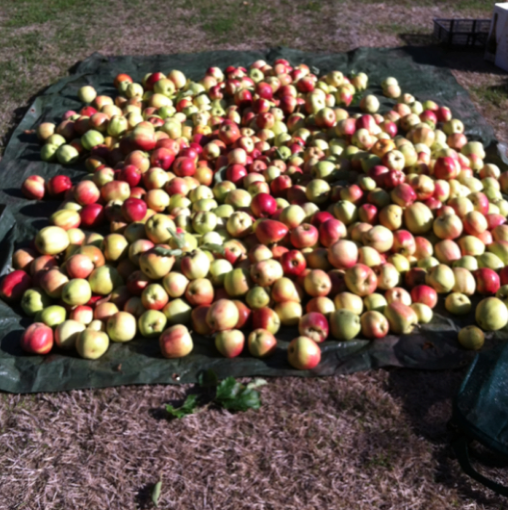 We bring orchard ladders and picking bags and try to gather as much as possible so there’s no waste. A staff member from the Food Program is always present to supervise the pickers and liaise with the landowners, and the Food Program carries insurance that covers our activities on your land. If you’re interested in harvesting or having us come pick, contact us for more information. Any produce or fruit is appropriate–we love unusual offers! Depending on weather and the pace of ripening, co-op members will likely be picking every Tuesday evening (6:30-8pm) and Friday (9-10:30am). We are looking for a commitment of at least three sessions over the course of the summer. At our trial pick we found that a person averaged 6lbs of tayberries in two hours (blackberries may yield more). Based on that rate, a co-op member could expect to take home 2lbs of berries per session. If you are interested in participating in the berry co-op, please email Colleen as soon as possible at galianofoodprograms@gmail.ca or phone #2737 and she will send interested parties a sign-up sheet for dates, with more details to follow. We had 10 people last year for Spring Starts and for the year-round crops and we hope to continue with the same plan. You can learn and share your knowledge about potting mixes and seeds. The group meets informally once or twice a week through the spring and summer. There is a watering schedule so there are daily visits by the participants to keep the plants well-watered. It is a teaching and learning environment so we have some teaching aids and good links to help further the skills of the Gardeners. 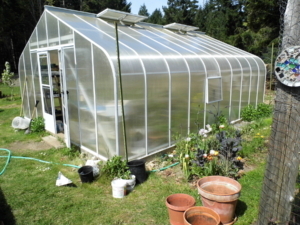 Inside, we grew tomatoes, eggplant, basil, peppers, melons and other seasonal vegetables. The planters outside the greenhouse are for runner beans and cucumbers. There are also ‘Seniors’ Beds’ which are used by a seniors group. We charge $20 for participants in the greenhouse group. This includes all soil amendments, seeds pots, and tools, but people are still encouraged to bring their own. We will provide some handouts related to our activities. For more information, contact Barry at 539-2364 or galianofoodprograms@gmail.com. Join us at the Seed Swap at our first meeting on Tuesday March 15th at 1:00pm. We will plan our growing space with seed catalogues and your own seeds to swap and share. Jump-start your 2016 gardening year!